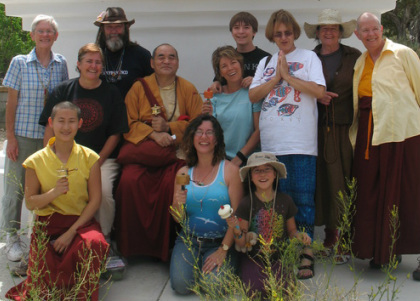 It is so wonderful that you have met with the Dharma and we welcome you to our Center! This page is designed to help answer questions you may have about Tibetan Buddhism, its practices, and so forth. We know what it is like to first walk into a center wanting to learn more about Buddhism and feeling unsure about where to start or even what questions to ask. It can feel so vast…and even a bit daunting! In Buddhism you will find a graduated path to learning, but you have to start somewhere, and we'll help you to the best of our ability. You can join in meditation, deity yoga practices, and discussion groups; attend teachings from authentic Buddhist masters; borrow from our lending library; or just come in for a cup of tea. If you'd like a personal meeting or have any questions, please feel free to contact us. Click on the links to the right to learn more. We look forward to seeing you at RigDzin Dharma! Learning Links - click for information! What are your Discussion Groups like? What is Deity Yoga Practice? Who are the "Deities"? What does it mean to "Take Refuge"? What is a Katta offering ceremony? Are there certain protocols to follow?